This is a Flutter plugin that bundles and wraps SQLCipher for Android, an open-source extension to SQLite that provides transparent 256-bit AES encryption of database files. Implements fully-encrypted SQLite databases stored on disk or in memory. Supports booleans, doubles, integers, strings, blobs, and timestamps. Provides a high-fidelity subset of the android.database.sqlite API to aid Android developers migrating to Flutter. Facilitates porting existing Android database code to Flutter. This example also uses Context from the flutter_android package to obtain the app's cache directory path. SQLCipher for Android 4.0.0, SQLCipher 4.0.0, and SQLite 3.25.2. Encryption. 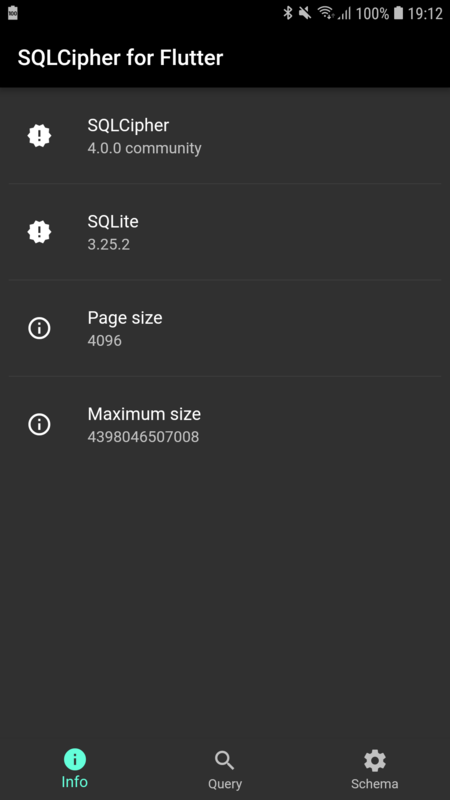 Android's native SQLite support does not feature database encryption. By using this plugin, you can trivially enable encryption for your app database, something likely appreciated by both you as well as your users. Compatibility. Android's native SQLite version varies greatly depending on the specific Android release, from SQLite 3.4 (released in 2007) to SQLite 3.19 (released in 2017, bundled in Android 8.1). Further, some device manufacturers include different versions of SQLite on their devices. By using this plugin, you gain a consistent, predictable, and up-to-date version of SQLite for your app regardless of the Android release your app runs on. Due to the bundled SQLCipher native libraries, your final APK size currently increases by about 6.7 MiB. We are actively investigating ways to reduce that footprint. (e.g., pruning .so files and using ProGuard). Why are some of the android.database.sqlite API methods missing? We don't generally implement methods deprecated in the current Android API level. For example, the SQLiteDatabase#isDbLockedByOtherThreads() method was deprecated long ago (in Android 4.1), so we have omitted it from the Dart interface when implementing this plugin. At present, iOS is not supported. This may eventually be addressed going forward by bundling and wrapping FMDB which includes SQLCipher support. At present, cursors are fully materialized. This means that queries which return very large result sets will incur nontrivial overhead in the IPC transfer of the cursor data from Java to Dart. We are planning on adding windowed cursor and streaming support in a future major release. In the meanwhile, OFFSET and LIMIT are your friends. DateTime SQLiteCursor#getDateTime() TEXT ISO-8601 "YYYY-MM-DD HH:MM:SS.SSS"
The sql_builder package implements a fluent DSL interface for constructing SQL queries. Demonstrates how to use the flutter_sqlcipher plugin. Flutter plugin for SQLCipher, an extension to SQLite that provides transparent AES encryption of database files.